Cost to pave a concrete driveway varies greatly by region (and even by zip code). Get free estimates from paving contractors in your city. Cost to pave a concrete driveway varies greatly by region (and even by zip code). Get free estimates from paving contractors in your city. How much does it cost to pave a concrete driveway? 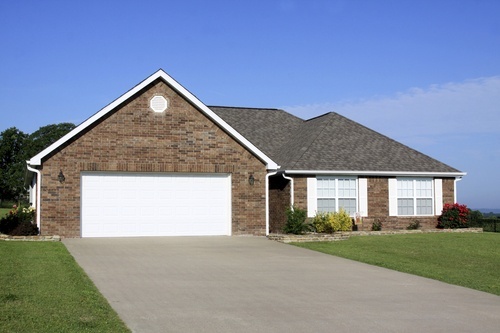 A paved driveway provides a stable and secure access surface for automobiles to move from the street to the house and perhaps a garage door entrance. Paving a typical two-car concrete driveway of 16 feet wide and 38 feet long (610 sq. ft.) without curves or slopes costs $3,040. Therefore, the average cost per square foot amounts to $4.99, although it can be higher if excavation is needed. The driveway is a 4-inch thick concrete slab 2 with reinforcing wire mesh. The required 7.7 cubic yards (including 4% loss) of prepared concrete is delivered by truck. The Total Cost includes the five-man crew that will be a total of 42 man-hours on the job, or a full day for the crew. Their included work is on-grade preparation of the driveway site, forms placing and removal, base material and final grading 3, and concrete finishing and curing. Their work does not include any landscaping activity before or after the construction, nor any sub-grade excavation of the driveway site. The DIY homeowner should count on at least 50 hours of work between five able persons (a 10 hour day for the crew). The crew will need to be working safely at ground level. Normal concrete hand tools are necessary. Decorative effects in concrete are available and include colored concrete for an average cost of $40 per cubic yard ($260 in this example) and embossed concrete for average cost of $1.70 per square foot ($1037 in this example). Excavation by hand of sub-grade average type soil is $50 per cubic yard ($325 in this example) using hand tools and dispersing soil in the local area. If necessary, land-clearing and site-preparation typical to a residential scale project including manual and mechanical removal of shrubs, trees, stumps, and boulders will typically range in cost from $0.50 to $1.50 per sq. foot depending upon the amount and size of the material, and the off-site distance of material transport. While specialist providers may deliver excellent and rapid results it may be wise to consult with a registered engineer especially if the design is complex or large. Engineering: whenever driveways have any sort of slopes, curves, or angles in them it usually means that costs are going to increase. This is due to the need for engineering to allow runoff to properly drain away from the home and into the street, and it usually also means more labor in preparing the surface. This construction may require approval from local administrative authority. 3 Grading: The process of evening out the ground's surface, making it either flat or sloped. How much does it cost to pave a concrete driveway in my city? Cost to pave a concrete driveway varies greatly by region (and even by zip code). To get free estimates from local contractors, please indicate yours. 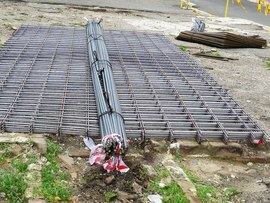 Cost Considerations: Rolled reinforcing mesh runs from $0.14 to $0.33 per sq. ft. Flat reinforcing mesh is slightly more expensive at $0.25 to $0.50 per sq. ft.
A flat area of concrete that can be used for a variety of purposes, such as a patio or a driveway. 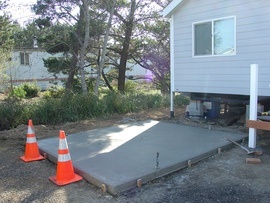 Cost Considerations: A concrete pad costs between $1.37 and $1.77 per sq. ft. The process of evening out the ground\'s surface, making it either flat or sloped. Cost Considerations: Grading the land to slope away from the house is important to prevent water from pooling around the foundation, which would lead to costly repairs. Grading costs about $2.35 per sq. yd.